We all like the chilli parrota served in SARAVANA BHAVAN . One day when my kids asked me to make this for tiffin, i told them that i will learn and make for them next weekend and temporarily closed their mouth with noodles. While searching for the chilli parrota recipe in blogs, i came across it in here. 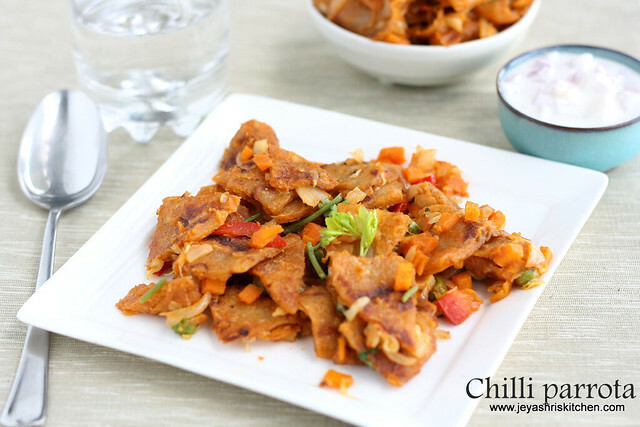 Try out this easy kid's friendly recipe and even we adults will love this chilli parotta for sure. I decided to try that and made a few alterations to suit my kids taste. It came out so well and kids finished it in no time. Take a non stick tawa and cook the parrota according to the instructions given in that. 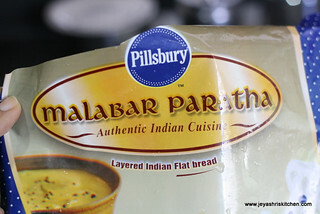 I used pillsbury malabar parrota. When the parrotas are ready cut them into cubes and keep it aside. In a kadai,put oil and add the cubed onions(ONE ONION),garlic,,ginger,redchilli powder,garam masala and saute till the raw the raw smell goes. Allow it to cool. 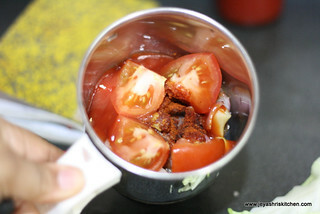 Grind it to a fine paste along with the tomatoes and tomato ketchup. Add oil in the pan and add the sliced onions and saute till it turns pink and add chopped veggies ( i used carrots, green peas, cabbage and capsicums)and add the ground masala, and saute for 3 mins. 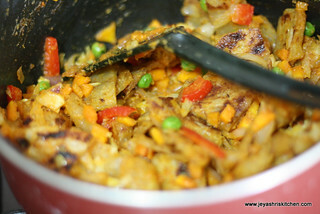 Now add the cubed parrotas and mix it evenly with the masala and just sprinkle a few spoons of water. Keep it in flame for 5 mins . Garnish with coriander. 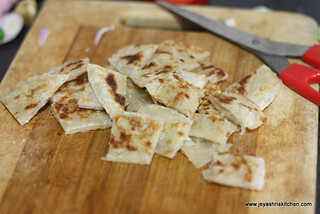 You can make the same using left over chapati | kulcha too. You can add boiled chick peas too. Absolutely mouth watering. :) Used to have this in hot chips :) Your version looks really interesting. would try it out soon. Hi jayashree! I guess I am first time here. 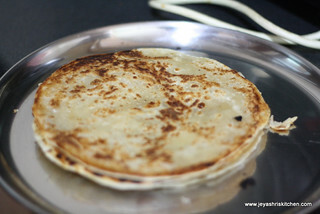 Love the way you have brought in a twist to the normal malabar paratha. U have got a great blog...thx for visiting my blog..Hope we cud be in touch! Thanks for dropping in...you have a nice space here..and who doesn't love chili parottas!..great looking ones.. I liked your blog very much. I appreciate for your beautiful presentation and mouth watering picture of chilly paratha. 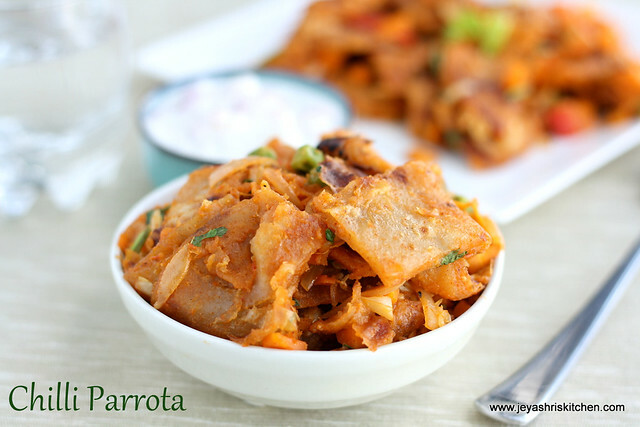 I love chilly paratha very much and shall try out your lovely recipe. Chili paratha looks yummy Jeyashree. 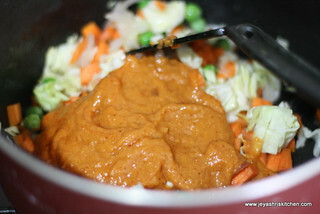 you have a nice blog with good recipes.You can visit my blog view my recipes and give ur comments. hi jayashri ! 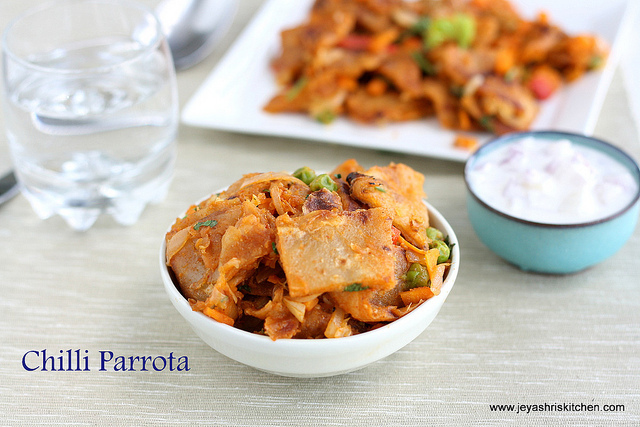 hw to make parrotta at home ? coz im living to interior that malabar parrotta packet may not available!